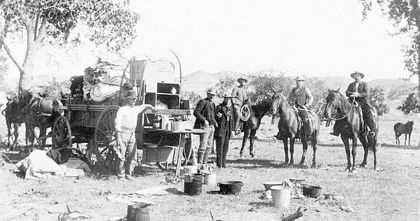 Chuck wagon food came in many guises, some good, some really really good, and some just horrid. Far be it for the cowboy to complain about the food that got put on his tin platter. No grumpy cookie wanted to hear complaints after he has just spent a long day on the trail, driving, setting up camp, tending wounds, herding cowpokes and cooking vittles. A smart cow wrangler ate what he got, smiled, and asked for more!! A day on the range eating dust .. you can even a plate of beans tasted like caviar.